It's hard to believe 2018 is nearly coming to a close! 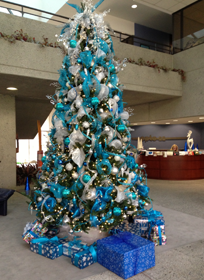 Our Opto 22 lobby is once again transforming for the holidays. As we reflect on an exciting year that included the epic launch of our award-winning groov EPIC platform along with many successful new customer applications, we want to extend our warm wishes and appreciation for your support and business this past year. We thank you for your investment in Opto 22 products and solutions, are eager to continue assisting you in any way, and are excited to see your projects grow and succeed. You can count on Opto 22 for cutting-edge technology, quick responses to your needs, and a sleigh full of new products in 2019. As we do each year, we'll be taking a few extra days around the holiday to spend with our families. So, please review the following schedule for placing orders and making any calls to our sales and support teams. Friday, Dec 28 - Open, Last shipping day for 2018! Wednesday, Jan 2 - Open, Shipping resumes.